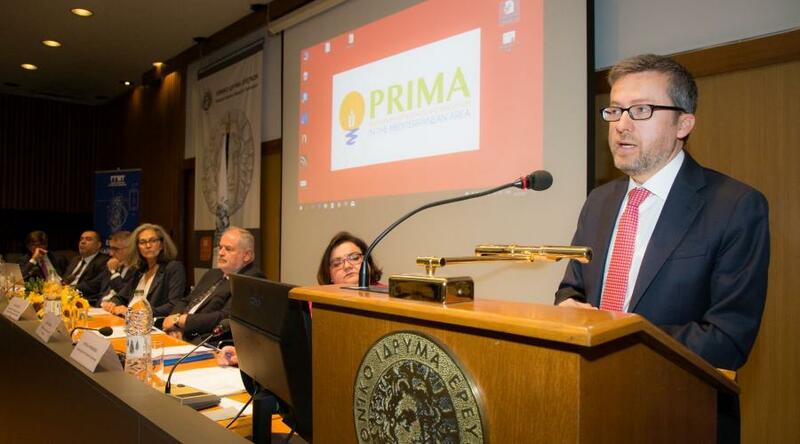 The aim of the PRIMA initiative is the promotion of innovative research approaches in dealing with the crucial problems in the management sectors of water and agri-food systems in the Mediterranean. The European Union Commissioner for Research, Science and Innovation, Carlos Moedas and the Deputy Minister of the Ministry of Education, the competent authority for Research and Innovation, Kostas Fotakis, were the key speakers at the event organised by the General Secretariat for Research and Technology (NSRT) for the Euro-Mediterranean PRIMA initiative (Partnership for Research & Innovation in the Mediterranean Area), at the National Hellenic Research Foundation in Athens on Monday 25th September 2017. The welcoming speech was given by the vice-president of the European Parliament, D. Papadimoulis and the event was co-ordinated by the General Secretary for Research and Technology P.Kiprianidou. Mr. Fotakis stresssed the particular significance the government gives to the research and innovation sector, and the restructuring of the country’s production model towards a knowledge-based economy. In that context, 240 million euros has been allocated in support of research and young scientists through the Hellenic Foundation for Research and Innovation (HFRI) despite the unfavourable economic climate. Commending the Deputy Secretary K.Fotakis for the very important initiatives which have been undertaken for the promotion of excellence and human capital, Commissioner C.Moedas stressed the need for further enhancement of the value of research to society. He pointed out that the PRIMA initiative is a model of science diplomacy, based on the principles of solidarity and equality, with particular importance for the Mediterranean and solving the multiple challenges associated with climate change, drought, population increase and migration. He noted that Mediterranean countries may be separated by borders but science, geography and culture unites them. PRIMA’s main objective is to promote innovation research approaches to deal with crucial problems in the management of water and agri-food systems in the Mediterranean, an area particularly affected by climate change, urbanisation, migration and population increase. The key priorities of the initiative are drought, food safety, the Mediterranean diet and its relationship with health, the need to transform the production capacity of Mediterranean countries in those areas and the creation of jobs. All actions will be implemented over a ten-year period (2018-2028), for which the total amount of funding is expected to be 500million euros. Funding will come from the EU Framework Programme for Research & Innovation, ‘Horizon 2020’, and national resources from the 19 PRIMA member countries (Spain, Portugal, Malta, France, Italy, Germany, Slovenia, Greece, Cyprus, Turkey, Israel, Lebanon, Jordan, Egypt, Morocco, Tunisia, Algeria, Luxembourg, Croatia). Greece, for example, will make a contribution of 10million euros through its Public Investments Programme over the ten-year period. The programme will target higher education institutions, research bodies, businesses in the private and public sector, irrespective of size, and other entities active in these areas, including primarily, projects based on international collaboration. Attracting a large number of people from the country’s research and business communities, the event, informed them about the initiative as a whole and particularly about the content of the first calls which are expected to commence in February 2018. The event was broadcast live online with the support of the National Documentation Centre. Video of the event is available through the Helios repository of the NHRF.